Digitisation and Industry 4.0 are causing the wind industry to rethink how it does business. Sustainable growth is a constant entrepreneurial challenge. The market is characterised by continuous evolution that never takes a break. However, unlike biological evolution, companies can decide for themselves to a large extent how they want to develop. The automation and digitisation of the working world is one of the greatest entrepreneurial changes of our time, and it challenges the wind industry to its core. Where does the industry stand in this process of change? It is exciting to see that wind turbine maintenance offers far more potential for development than many might think. Deutsche Windtechnik, a specialist maintenance provider for wind turbines, has internalised the principles of Industry 4.0 and is now at the forefront of this development. The process has been in full swing for years. Ever-shorter development cycles in numerous areas are increasing the speed of change management. Information is available more quickly worldwide. Trends are being circulated around the globe very quickly and products are changing and being placed on the market in ever shorter cycles. At the same time, the range of potential decision-making options is increasing rapidly. This can make it hard to keep a cool head and always back the right horse. One fundamental change is the fact that the rapidly shortening development cycles mean we can all say goodbye to the dream of developing a system that will ensure the long-term success of a company. In the IT area, powerful ERP systems that cover a wide range of business applications and process and store operating data in databases are barely able to keep up with the different wishes and requirements of markets and users. Even the Big Five ERP vendors are increasingly opening up their software and providing interfaces to allow the integration of subsystems. These companies are actively promoting small, independent start-ups, which are developing new custom software because they are both closer to the special needs of the market as well as being more agile and creative. Later, these same solutions are integrated or the companies that developed them are acquired. In the wind industry, especially, there are many of these custom solutions. 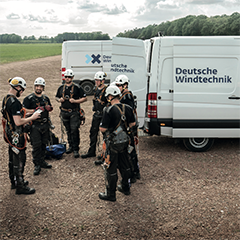 Deutsche Windtechnik has helped to develop many of the solutions on the market, but it is now also increasingly focusing on developing its own solutions.